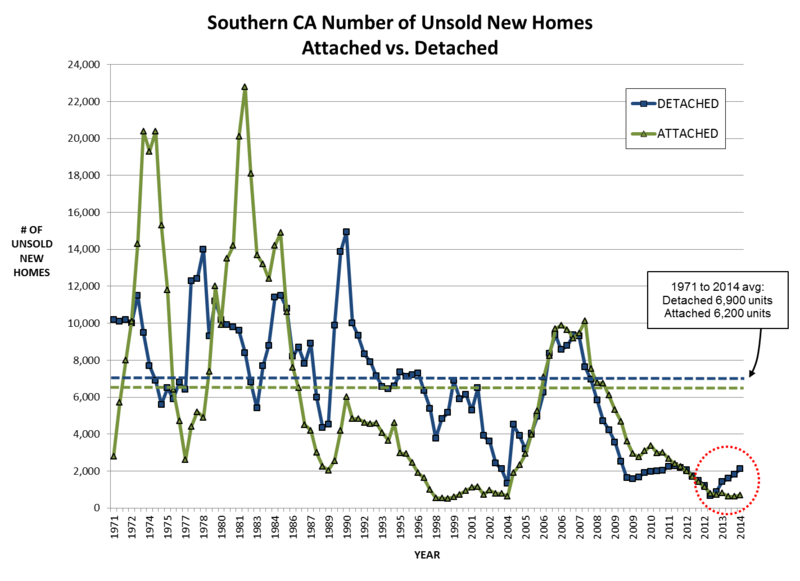 The headline screams, “Southern California New Home Inventory Has Almost Doubled since the Beginning of 2013.” Terrible news, right? Not necessarily. Even with the increase, new home inventory levels* are still near all-time record lows and are highly unlikely to reach back up to prior highs. While single-family inventory is up, it is currently only back to 2012 levels. The condo market is still at historically low levels of supply. 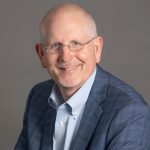 Fewer large sites for masterplans, fewer active projects, smaller unit counts per project, smaller phase release sizes, and tighter construction financing releases all have a limiting effect on inventory levels. 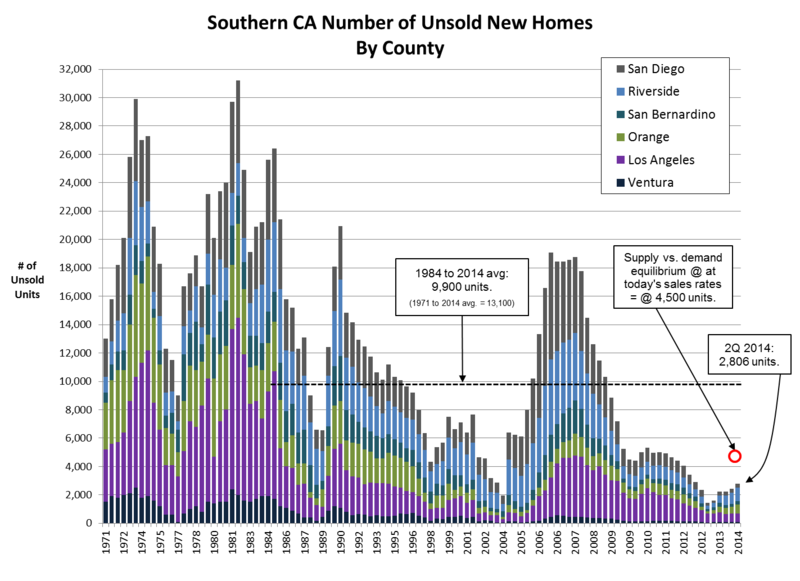 As of the end of the second quarter 2014, there were only 2,806 units of unsold new housing inventory in all of Southern California. While it is true that the current inventory represents a 92% increase from the beginning of 2013 (1,458 units), the fact is that the beginning of 2013 represented an all-time record low over the last 43 years. From 1971 to 2014, there were an average of 13,100 units of available inventory on the market, and even looking at just the last 30 years (1984 to 2014), there were an average of 9,900 units of inventory. As such, the current inventory is 72% below the average of the last 30 years and is 79% below the average since 1971. Running out of land. The three primary coastal counties (Los Angeles, Orange, and San Diego) have far less “greenfield” land left for large-scale new home developments than even just five years ago. Fewer master-planned communities equates to less supply. Fewer projects. Actively selling community counts are far lower today than 10 or 20 years ago. Fewer projects means fewer units coming to market. Lower unit counts. The average total number of units in a project has shrunk considerably over the last 30 years. In San Diego County, project sizes have decreased from a median size of around 125 units per project in the 1980s, to 90 in the 1990s, to 78 in the 2000s, to just 59 units today. With fewer units per project, there are less total units to bring to market. Smaller phase releases. Phase release sizes have decreased over the decades from 10 to 20 units per phase in the 1970s and 1980s, to 4 to 6 units per phase today. This is a very important factor, as builders now control their inventory levels much more than in previous years. Tighter construction financing. Construction financing is much more closely tied to actual sales performance than in the past. It used to be possible to release 10 to 20 homes at a time, take some reservations, and then move on to the next phase. Today, phase releases are more typically only 4 to 6 units, and lenders often require builders to have 50% to 100% of units under contract (not just reserved) before releasing funds for the next phase, greatly reducing the potential for overbuilding. Interestingly, all of the increase in inventory levels has come in the single-family market, while condo inventory levels remain at historic lows. In many markets in Southern California condominium projects are achieving faster sales rates than single-family projects (primarily due to lower price points and/or strong infill locations near jobs), which is keeping a lid on condo inventory levels. Also, there is very little new high-rise development taking place today compared to the mid-2000s, and there is still virtually no condo conversion activity today (compared to high levels of condo conversions in the mid-2000s). A careful understanding of market supply and demand conditions can make the difference between a successful project and an unsuccessful one. Pete Reeb has been providing advice on the new home market to builders, developers, and investors for over 30 years. *New home inventory is defined as new homes that have been released for sale but not yet sold. Includes both completed homes and homes under construction. Does not include homes that have not yet been released for sale. If you have any questions, please contact Pete Reeb at (858) 558-8384 ext 152 or by email.